My first “real” job was as a waitress at Baker’s Square. Oh, the pies! We would often get to take pies home at the end of the night shift, because they only served fresh pie. You can imagine how popular I was with my family. We had French Apple Pie, Fresh Strawberry, Lemon Supreme, Strawberry Cream Cheese, Pecan, Cookies and Cream pie, and all of the fruit pies, but my favorite was French Silk. Taking that home was an extra special treat. It was perfect, because it froze well, and I could take a few of them home at a time. 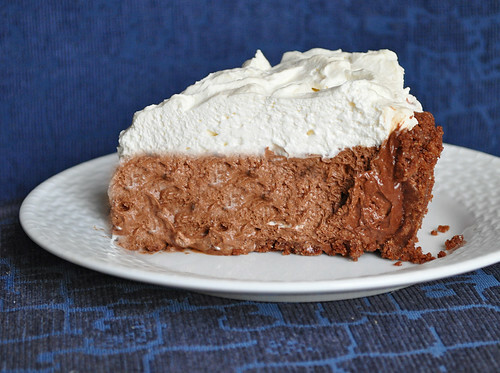 Smooth, chocolatey goodness with just the right amount of real whipped cream and chocolate shavings. Mmmmmm. 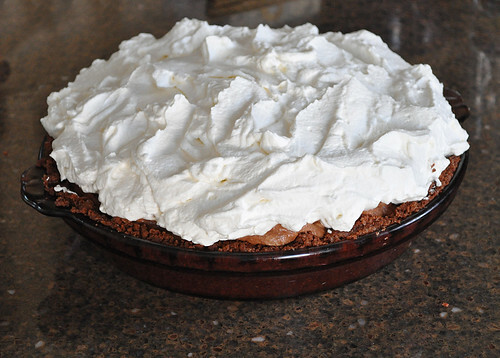 Often, as we worked, we’d have to throw out a slice of pie that had gotten hacked or was too small or too sloppy-looking to serve. We’d put them in the bottom of the pie cooler, and each time we’d go by, we’d take a spoonful of whatever happened to be down there. (I always kept a clean spoon in my apron pocket.) Usually there was a good selection, as the serving staff all had their favorites, and “accidents” happened fairly frequently. I was constantly in motion those days, yet when I quit there and moved on to the next job, I lost 10 pounds immediately. But I sure do miss that pie. Fill a large skillet with 1″ of water. Heat until bubbles start forming along the bottom, then adjust the heat to maintain the water at this temperature. This is very important that your water does not get too hot! Set over water bath and whisk constantly until thick and puffy, like marshmallow sauce. Remoc=ve from water and whisk thoroughly into chocolate mixture. LET COOL TO ROOM TEMPERATURE! Increase mixing speed and beat until stiff peaks form. 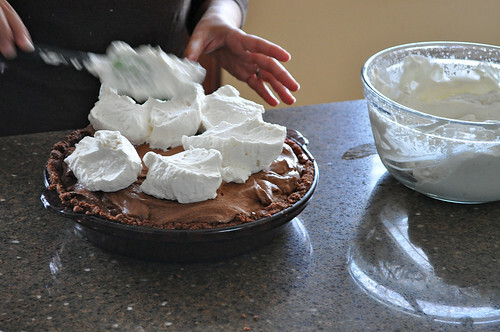 Stir in a quarter of this mixture into the cooled chocolate mix, then fold in the remaining whites. 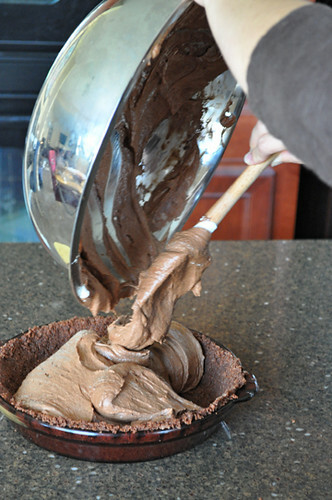 Fill pie crust with mixture, refrigerate for at least 3-4 hours. I love this blog, but I don’t think I’ve ever left a reply until now. When my wife and I were dating, I was the Asst. Mgr. at a local “H.S. Fish & Chips” (owned by the KFC corp). Their fish and chips (fries) were to die for. And, yes, we had the same policy; anything extra at the end of the evening had to be pitched (or taken home). I always went over to my ‘girlfriends” house after work, so her whole family would be waiting for me to show up with a late night snack. In time, my future mother-in-law would even have the table set, waiting for me to arrive. Great story Bill – thank you for sharing it! Bill that’s a wonderful story, congratulations on those 37 years! Thanks for sharing your story, it certainly brought a smile. So I used to have a restaurant that served French Silk Tart and in fact it was a fave. But the one I can’t find, perhaps you have. Mocha Espresso Delight? Does that ring a bell with anyone out there? By the way–know of your blog because of Kevin and Rose–grateful for their friendship and now this link! Am liking it a lot! Thanks. Thank you for the kind words Jennifer! I’ve never heard of Mocha Espresso Delight, it sounds wonderful, so if you ever do find it – please share!